How many artists and creative workers are there in Minnesota? What do artists need to succeed? What is the economic impact of individual artists? What are the most common arts jobs in the state? How much has the economic impact of Minnesota’s nonprofit arts and culture organizations grown in the last two years? All of these questions, and more, will be answered on Feb. 28 when the Creative Minnesota 2017 Report is released at the Minnesota Historical Society Auditorium in St. Paul as the kick off of Arts Advocacy Day. The first Creative Minnesota report, released in 2015, was a snapshot of the health and impacts of nonprofit arts and culture organizations. 2017 study updates the previous study and also looks into the economic lives and needs of artists in Minnesota. Creative Minnesota is a collaborative effort by most of the statewide arts supporting organizations in Minnesota to provide hard data about Minnesota’s cultural field and to improve our understanding of its importance to our quality of life and economy. It is part of a long term endeavor to collect and report data on the creative sector every two years for analysis, education and advocacy. 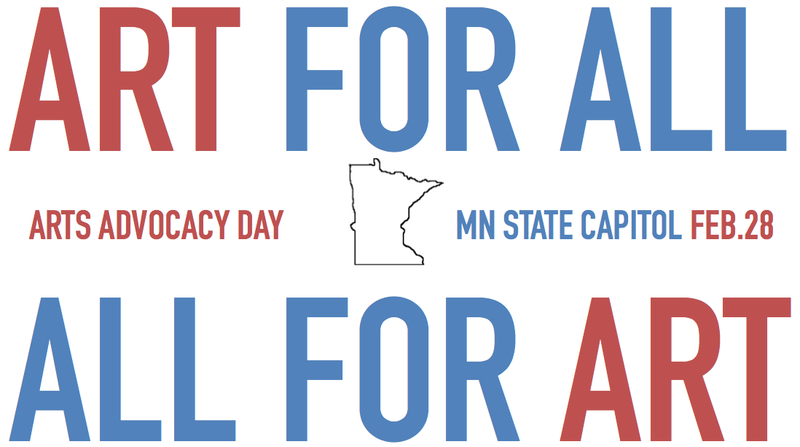 Be a part of arts advocates coming from every corner of the state to the Capitol in St. Paul to protect state funding for the arts. There were a lot of changes at the Minnesota legislature, just as there were at the federal level, this election. It’s time together as one arts community and make sure the arts are protected. Arts Advocacy Day is your chance to make a difference. Our decision makers need to know about the strong arts community in Minnesota. You will be with many people who also support the arts. What could be better than that! Once you are registered we’ll assign you to a team which will be led by your own personal guide around the Capitol grounds. After attending the morning rally where you will learn the “Message of the Day,” your team leader will help you meet your legislators and advocate for the arts. Arts Advocates are the coolest people we know. Be like them! This year you can also experience the beautiful and newly renovated State Capitol. Tours of the building will be available betweenvisits with legislarors so you can take time to see for yourself the art and architecture. You will meet great people from every corner of the state who love the arts. Working together we will prove again the strength of Minnesota’s arts community. Help us help you protect arts Legacy funding, making sure we remain the strongest arts community in the country. 8:45 AM First timer Arts Advocate training.